Beauty and the Beast (2017) – Movie Review – Another Movie Blog! However thin the excuses have been for Disney’s recent live action remakes beyond just making money, up until this point the creative teams behind each have looked as though they wanted to bring something different to their adaptations. Cinderella (2015) reframed the story to be more from the point of view of its main character, Jungle Book (2016) adapted out some of the more uncomfortable elements of the source material whilst experimenting and attempting to perfect film technology, and Maleficent is a drastic reinterpretation of the classic Sleeping Beauty villain (which makes it the most interesting, if not the best). The films have ranged from the pretty damn good (Pete’s Dragon) to the outright atrocious (Alice in Wonderland), but all have brought at least a minute justification for their own existence. 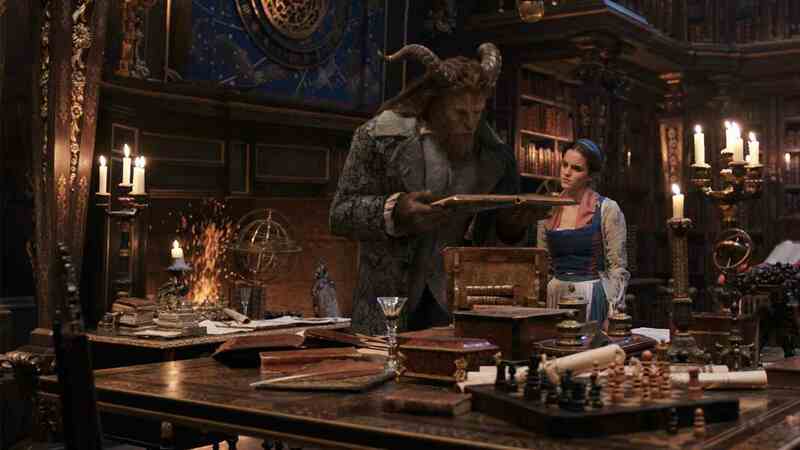 2017’s Beauty and the Beast marks the first one of these live action adaptations that exists from beginning to end to capitalise on nostalgia for the childhood classic. That should have been obvious enough from the trailers, which capitalised on floral images and the tagline “Be Our Guest” one would only know if they had seen the original film. One can’t completely begrudge the idea of enjoying Disney essentially make its own 200million dollar fan film with big stars (or perhaps to make it for families with children who don’t know the original off by heart). And with not one classic movies to Beauty and the Beast’s name but two (Cocteau’s surreal masterpiece La Belle et le Bete), the tale as old as time can have many reasons for reinvention. But the movie doesn’t reinvent: its pads. It is forty minutes longer the Disney version, and feels that it can improve on the story for the first animated movie ever nominated for the Best Picture Oscar with overlong explanations about aspects of a fairy tale story it didn’t feel were explained enough. The man who got turned into a fluffy outcast of society now has an even more tragic backstory, to also serve as a weird moral justification for why the servants got turned into household items. There’s a plot thread that exists just to explain why the villagers didn’t know about the castle, but it just raises more questions than it answers. And, along with the magic mirror, a new story-breaking item exists solely to take us to one new location to expand on Belle’s childhood backstory that doesn’t go anywhere and is not anything you couldn’t just infer from conversation. There’s also the little changes like the fact the Beast in this version is literate, that don’t seem to add much until you remember that in the animated film Belle and the Beast bond over education where he therein starts to show Belle his vulnerability (it also leads to a funny bit here where he beastplains Shakespeare to Belle when she says her favourite play is Romeo and Juliet). It’s the culminate effect of things like this that rob the central couple of their chemistry. Dan Stevens is a great actor, but his version of the Beast is, simply put, just not that beastly. Barring the prologue there is littler transformation of him from Beast to man in both persona and in looks. In deciding to keep his facial features human it robs him of either the animalistic qualities of the Disney version or the tragic enigma of the Cocteau version. If they decided not to be especially creative with the design, then it boggles the mind more he is not just a makeup effect instead of distracting CGI. Also distracting is the level of autotune on Emma Watson’s voice. Casting Watson as Belle seems a no-brainer, and indeed she is fine as the character in and of herself (it’s hard to ask for another Paige O’Hara). but when there are actors trained on Broadway, like Josh Gad, singing the classic tunes it is not difficult to hear just how much processing is done on her voice. For what it’s worth, the original songs are still great and fun to hear on the big screen, and combined with Luke Evans as a less buffoonish and more sinister version of Gaston are among the better parts of the movie (as indeed is the less buffoonish and more noble version of Belle’s father played by the always excellent Kevin Kline). New songs written for the movie aren’t all as memorable (though nostalgia does play a part) but the Beast’s “Evermore” is itself a stand out, even if the lyrics actual end up contradicting how the character feels in the very next scene. But the musical sequences are as well directed by Bill Condon as the movie in general, which is to say not very. The frame is so busy and cluttered, even when it doesn’t make sense for a provincial town, and the recreation of certain iconic moments that no longer make any sense lead to some unintentionally funny moments (Belle seems to walk about 5 hours to recreate her Sound of Music from the “Belle (Reprise)”. Again, it would easy to disconnect this from the animated film if it didn’t wallow in its own nostalgia of it. The animated film had carefully chosen colours palettes, a kitsch but beautiful design and fluid simple movements of camera. This version ugly and garish character designs for Lumiere, Cogsworth and Mrs Potts, poor editing and staging choices that make everything feel static, and a blue filter over everything even remotely beautiful. This is a tale as old as time, and this Beauty and the Beast is selling us on it being old. Nostalgia is such a powerful tool that it will convince people to travel to the cinema and watch lesser versions of movies they can watch twice in the same amount of time in their own home. But, hey ho, be Disney’s guest. Just know if you do they’ll keep asking you back. Oh, and the Le Fou “controversy”: a complete non-entity. Disney doesn’t get to claim bonus progressive points for a 1.5 second shot of men hugging and jokes about suppressed homosexuality that The Simpsons has been doing for near 27 years. There are Disney Princes that are gayer than this movie.